I recently participated in an on-line discussion about "selling" general aviation to the public. The word "selling" always makes me cringe because "selling" in this context has always sounded to me like a euphemism for "convince via falsehood". Perhaps a better way to express the point of the discussion is not so much "selling" but "demonstration of practical value". This is an interesting notion to me. When I began flying, I never tried to ascribe a practical value to my avocation. For me, flying holds immense emotional value. Quantifiable, practical value? Not so much. One commentator noted a specific scenario of a seven hour drive that could be replaced by a two hour flight in a piston powered single engine aircraft. He went on to note that the airlines, while always an alternative, can be a logistic nightmare when the points of origin and destination are not near major airports srved by the airlines. He concluded that general aviation actually delivers value in those particular scenarios. I thought he made an excellent point. To my surprise, most of the other pilots disagreed and nit-picked this suggestion. Obviously, there are caveats. Is flying a Cherokee or Skyhawk competitive with the airlines for coast to coast travel in the United States? Absolutely not, neither in terms of time nor cost. At some point, single engine fuel costs will exceed the ticket price for a too small seat on a typical Flying Greyhound. Furthermore, whereas flying Delta across the country is transportation, flying a single engine airplane along the same route is an adventure. And our airplanes are also limited in terms of weather. Even if I were instrument rated, thunderstorms and icing conditions are still not to be trifled with. Would I recommend the average non-pilot go out and train, become a private pilot, and buy a light aircraft solely as a means to facilitate travel? Of course not. But when the weather is good and the trip is of moderate length (say, six to eight hours by car), I would argue that a trip by single engine airplane is quite practical. Cheaper than driving? No, I don't mean to suggest financial practicality. After all, there is still the cost of purchasing and maintaining an airplane to consider. But if one has already committed that particular act of madness, the airplane becomes a viable alternative to driving or flying commercially. On top of this, when there is a three year old riding in the back seat, exchanging nine hours in a car for three in Warrior 481 has tremendous value. Quantifiable value? Perhaps not, but value nonetheless. Parents will understand. This was reinforced for me on the weekend of July 30 - August 1. We needed to be in southwest Michigan for a wedding on July 31. A one way drive would require eight to nine hours in the car versus about three in Warrior 481. Naturally, we planned to fly if the weather was good or drive if the weather looked poor. When the forecasts suggested thunderstorms on our intended return date, I was amazed at the dismay Kristy and I both felt. Perhaps we are spoiled. The prospect of exchanging a six hour round trip flight for eighteen hours in the car with a tenuously potty-trained three year old was extremely unappealing. Of course, the car still trumps (1) getting stranded somewhere or (2) taking unnecessary risks around thunderboomers. When I experienced that dismay, I realized that I had proven my own point about the value of general aviation for short trips. That value may not be quantifiable in simple units like dollars, but it is real. The weather forecast for Friday was pristine, it was the chance of thunderstorms over Rochester during our return flight on Sunday that concerned me. As I watched the forecasts over time, Sunday gradually improved. The forecast was not perfect when we made the decision to fly, but we arranged a back up plan to get home by Monday morning should weather shut us out of flying back to Rochester. Another interesting twist was President Obama's appearance at a Chrysler plant in Detroit that created a no-fly zone around southeast Michigan reaching almost as far south as Toledo and almost as far north as Flint. The deviation to the north that this TFR (temporary flight restriction) would cause effectively nullified the advantage of flying directly across Canada. So, for the first time since 2006, our flight to Michigan took us south of Lake Erie. We followed the Lake Erie shoreline at 8500 feet. 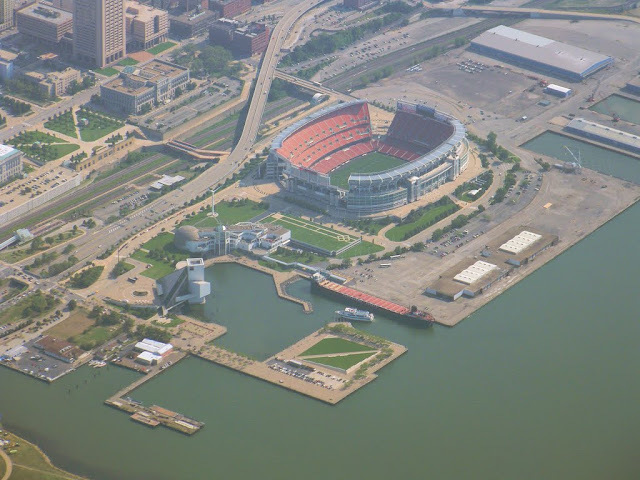 Cleveland was cloaked in evening haze, but we were nonetheless able to spot Cleveland Browns Stadium, the Rock & Roll Hall of Fame, and the Great Lakes Science Center (above). Downtown Cleveland photographed from 8500' in the haze. We made a pit stop in Port Clinton, OH for The Bear to get a potty break. En route to Port Clinton, we flew directly over Cedar Point. 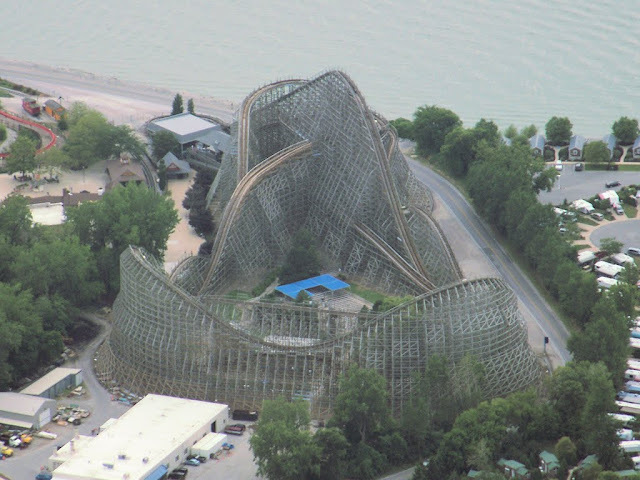 This wooden mountain is the "Mean Streak". I've said so in these pages before...I do not like roller coasters. Intellectually, I have no issue with them. But my stomach HATES them. 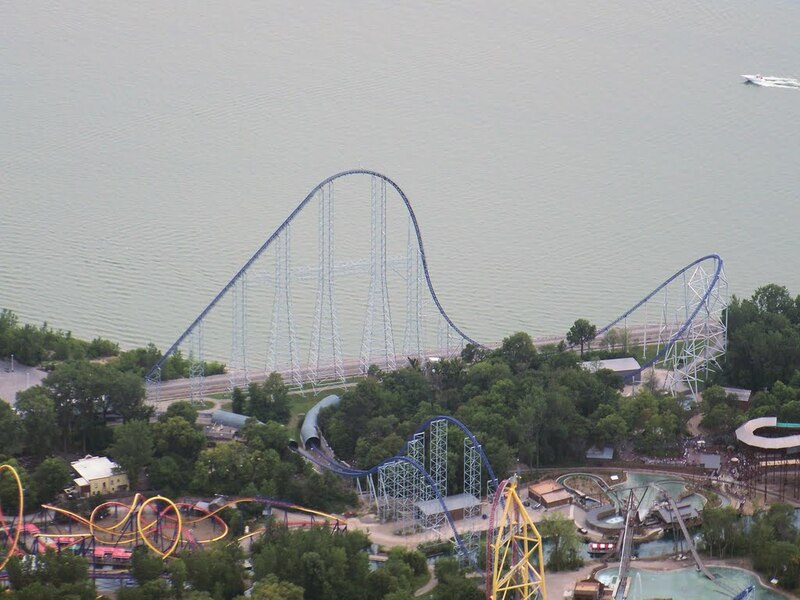 This dramatic arch is part of the "Millennium Force" roller coaster. I do not think my stomach would enjoy this one, either. Our flight for the evening concluded with Warrior 481 in the care of the terrific folks at Duncan Aviation in Kalamazoo, MI. Dinner was at Erbelli's: Chicken Mushrella pizza and draft Oberon. That pie really hit the spot; bland pizza is my greatest disappointment with the food in western New York. In addition to the wedding, we spent time at the Air Zoo (The Bear loves the balloon ride) and fed the giraffes at Binder Park Zoo in Battle Creek. We saw several of our favorite people, ate at our favorite restaurants (Erbelli's, Food Dance, and Bangkok Flavor - a Kalamazoo culinary trifecta), and drove past our previous house (Dude, there's an in-ground sprinkler system installed. Please use it). The journey home still held some uncertainty. Would thunderstorms actually develop over western New York? Upon departure from Kalamazoo about 4:00 pm, radar showed light rain in the vicinity of Rochester. Cloud cover varied, but ceilings were acceptable and the shorelines of Lakes Erie and Ontario were both clear. We determined that we would follow the shoreline and get as close to home as we could. After all, the key to VFR cross country flying is flexibility. We stopped for fuel at Three Rivers, where I did my original flight training. The fuel price was great, but the tableau was depressing. The field was deserted, runway markings had faded into illegibility, and some rather substantial weeds had forced their way through cracks in all paved surfaces. It was obvious that no one championed the airport any longer. The final straw came when I pulled the trigger on the fuel nozzle and a fountain of 100LL erupted from the side of it, splashing across Warrior 481's wing. That's fine, I thought to myself, I need to wax the wings anyway. But I needed fuel in the tank, not on the wing, to get home. Fortunately, I discovered that I could still use the nozzle provided that I ran it at an excruciatingly low flow rate. Our refueling stop at my aeronautical home was thus unexpectedly lengthy as well as depressing. At the wedding, all guests were provided with a small box of green gummy bears who seem to hold some meaning for the bride and groom. Everyone was asked to include the gummy bears in their adventures and share photographs with the newlyweds. Here's our first contribution. 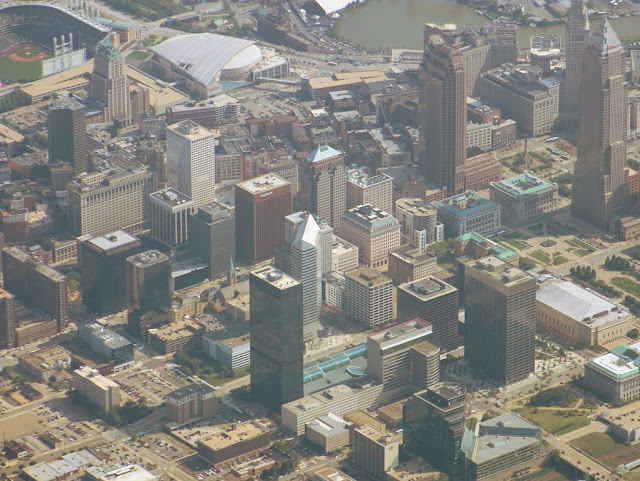 I call it "Gummy Bear Over Cleveland" because I'm just so darn literal. We stayed over Lake Erie within gliding distance of the shore. At 9500', that's not hard to do. A scattered cloud deck flowed past our wingtip between Erie, PA and Buffalo (above). We maintained a listening watch on automated weather observations from airports ahead of us. The way home proved to be clear and without much ado, we returned home. There are always concerns when traveling cross country by light aircraft, weather being among the most significant. But when conditions are right and the ability to be flexible exists, the airplane has become a wonderful tool for making quick trips of moderate distance. In the last four years, it has enabled us to make day or weekend trips to places like Kalamazoo, Michigan; Clarkston, Michigan; Plymouth, New Hampshire; Knoxville, Tennessee; Luray, Virginia; Lake Placid, NY; Bridgewater, NJ; and several others. Without the airplane, many of those trips would not have occurred. The airplane has helped us introduce The Bear to some of her grandparents, has helped to keep us connected with friends and family, and even facilitated visits to friends in need. And of course, there's the reason I bought it in the first place: the endlessly therapeutic joy of aviating. I did not buy an airplane with the intent of making any practical use of it. But having taken the plunge, the occasional trip has proven to be a wonderful -- dare I say valuable? -- side benefit. On the morning of July 26, 2010, two families set out in their airplanes for Luray Virginia, home to Luray Caverns. It was time for The Bear to visit her first cave. Darrell and his family flew within a few miles of us. Along the way, we stayed in contact with various center controllers, but also monitored 122.75, the designated air-to-air frequency, in case we needed to talk directly. 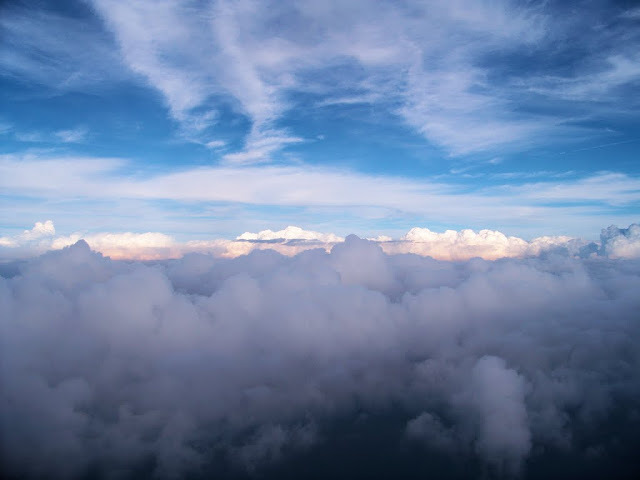 Although Darrell and I occasionally checked in with one another, we mostly listened to a few hours of dreadfully banal conversation between other pilots that contrasted sharply with the professional broadcasts on the Center frequencies. Our lunch stop was a favorite of Darrell's: the Kitty Hawk Cafe at the Altoona-Blair County Airport. The Bear has arrived at Altoona, PA and she is hungry! Traveling companions: Warrior 481 and Cessna 41H. That's Darrell, prairie-doggin' over the Cessna's cowling. It was here that I bombed in my attempt at clever humor, when I commented out loud that it would be cool if the Luray airport was run by a guy named Roy (you know, since Le Roy is run by a guy named Ray). The utter bafflement on the faces of my adult companions clearly indicated to me that my comment was neither clever nor amusing. Lunch was good, but surprisingly slow. Our departure was much later than planned, which was when we realized that we would be making a late return to Le Roy. The Altoona airport is surrounded by a gorgeous, emerald valley. During the short hop to Luray, we were bounced between a surprising number of Cleveland and Washington Center controllers. I am particularly grateful to the Washington Center controller who helped me avoid an unseen VFR aircraft lurking at the north end of the Shenandoah Valley. When we reached the Shenandoah Valley, there was no mistaking it. It's an amazing sight. Looking southeast down the Shenandoah Valley while descending to the Luray Airport. Did I mention that it was a magnificent day? John at the Luray Airport shuttled all seven of us to the cave which was less than a mile away. Because we had three child seats between us, the women and children went first while Darrell and I waited with the airplanes. It was HOT on the ramp in Luray. Darrell and I waited under the wing of his Cessna to provide some relief from the sun. We did some low altitude formation work with Darrell on the ramp at Luray. Luray Caverns are considered to be one of the most "decorated" caves in the world. Really, the formations are amazing. A stalactite covered ceiling arches over Dream Lake. The lake is shallow, but so smooth that it reflects the ceiling like a mirror. A spectacular column with Darrell and son standing nearby for scale. This formation of flow stone reminded me of a frozen waterfall. A spectacular example of so-called "draperies". More cool stuff. Really, the whole place is filled with formations like this. The Bear and Kristy wandered through a fantastic landscape. Eventually, it was time to return to our airplanes and depart for New York. Because we did not depart until after 6:00 pm, we made the decision to forgo our originally planned dinner stop at Franklin-Venango Regional Airport in Pennsylvania and fly directly home to Le Roy. Leaving Luray, I paralleled the western ridgeline defining the Shenandoah Valley. I contacted Washington Center and once again began receiving advisories. The first two Washington Center controllers couldn't read Darrell's transponder, but seemed content in knowing that he was flying a mile behind me. 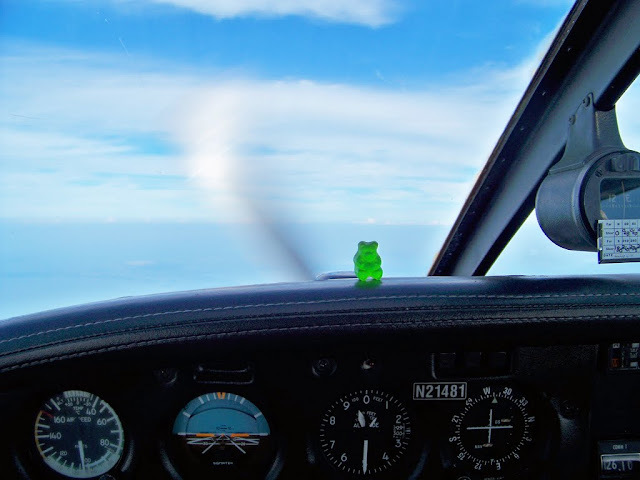 When I couldn't raise Center on my #1 comm radio, Kristy wondered aloud if both airplanes were falling apart (i.e., she switched from mocking the ludicrous chatter on 122.75 to mocking our airplanes). Darrell assured me on the air-to-air frequency that #1 sounded fine and there were no further problems with it that evening. Over south central Pennsylvania, we encountered some clouds directly at our cruise altitude. We climbed to 9500' to clear the clouds and haze. For a time, the sun was obscured by high clouds. It was a pretty ride home, cruising along between the haze layer below and the clouds above. Occasional glances to my five o' clock revealed the reassuring shape of Darrell's Cessna not far behind. As we crossed back into New York, The Bear awakened and busied herself with her sticker book. The approach controller at Rochester seemed surprised to have two aircraft inbound to Le Roy and asked if we had the litany of active NOTAMs for the field (including the much-maligned fence NOTAM on the runway 28 approach that no Flight Service briefer yet has been able to deliver without a healthy dollop of snark). I responded that Le Roy was home base for both of us and that we were familiar with the NOTAMs. The controller was further surprised that there was additional traffic in the pattern, which turned out to be Matt. Indeed, Le Roy was hopping when we returned. It was a good day of flying (and caving) for everyone. Dan, Brian and I attended the "Greatest Show on Turf" in Geneseo, NY. I think I can say without hyperbole that this was one of the best times I've ever had at an airshow. The skies were blue, there was no rain, temperatures were moderate, and so were the crowds. Rob Holland put on a superb aerobatic act, as always. Perhaps the most gripping display was one that much of the audience missed: an aerobatic sailplane routine performed by Manfred Radius. I've never seen a glider do hammerhead stalls before and the low, inverted pass/ribbon cut was spectacular. And, of course, we saw plenty of magnificent vintage aircraft up close and personal. Antitorque rotor of a Rochester-based Blackhawk helicopter. My token "artsy" shot for the day. A New York-based C-130 Hercules put on quite a demonstration. It may look ungainly, but you have to admire the capabilities of the C-130. It's a modern-day DC-3. The C-130 on final approach for runway 23 at Geneseo. The Corsair Skyboss was visiting from Long Island, NY. Another shot of the Corsair waiting to taxi for takeoff. There's no mistaking a flying Corsair for any other aircraft. A Fairey Firefly (British), based in Hamilton, ON. Glamorous Gal, a P-51 Mustang from Long Island, NY on its takeoff roll. I think this is my favorite photo from the entire set. As always, the Harvards were present in force. Unfortunately, we were eating lunch under a tent during much of the Canadian Harvard Aerobatic Team's performance, but just hearing the harmonious growling of three Pratt and Whitney radials was enough to keep me happy. A Curtiss Helldiver from the Commemorative Air Force flew formation work with Skyboss. This is the only flying Helldiver in the world. The Helldiver taxies for takeoff. Helldiver turning base for landing with its dive brakes extended. A rare Westland Lysander British liason aircraft with outstanding short field performance. The "belle of the ball" was the "Hollywood" Memphis Belle, based in Geneseo. I think the nose art has been repainted since the Memphis Belle arrived here a few years ago. ...the interior quarters are rather tight. For a five dollar donation, I was able to climb, crawl, and slither my way through the narrow passages inside. It was money well spent, though $5 is probably not even enough to cover the fuel cost of starting a single one of the Memphis Belle's four radial engines. The Memphis Belle made a few passes on the field, once with her bomb bay doors open. She literally posed for photographers on a subsequent pass. Miss Hap, a B-25 Mitchell bomber from the American Air Power Museum. Never Miss, a P-51D Mustang on short final. During its performance, the announcer commented that the pilot couldn't find the Geneseo Airport on his way in. I'm sure Never Miss's pilot was delighted by that announcement. Then again, he's flying a freaking Mustang, so how unhappy could he be? Old Red Nose, a P-51D from the Dixie Wing of the Commemorative Air Force. Take-Off Time, a privately owned B-25 bomber. Take-Off Time makes a pass of the airfield. A P-51C Mustang in Tuskegee colors painted as a tribute to the Tuskegee Airmen.